Monogram Professional ranges offer the impressive look and performance of commercially styled appliances in a selection of sizes and configurations. All Monogram professional ranges give you the advantage of dual fuel sources. 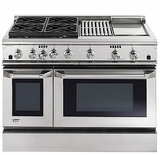 Cooktop burners use a responsive gas flame, while an electric, self-cleaning convection oven provides precise control for roasting and baking.